This unusual combination was based at Station Foxtrot in the East End of Newcastle. The boat was launched from Spillers Quay using a TL to lift it from the transporter into the river Tyne. Twin 50HP outboards gives the all aluminium boat a good turn of speed. 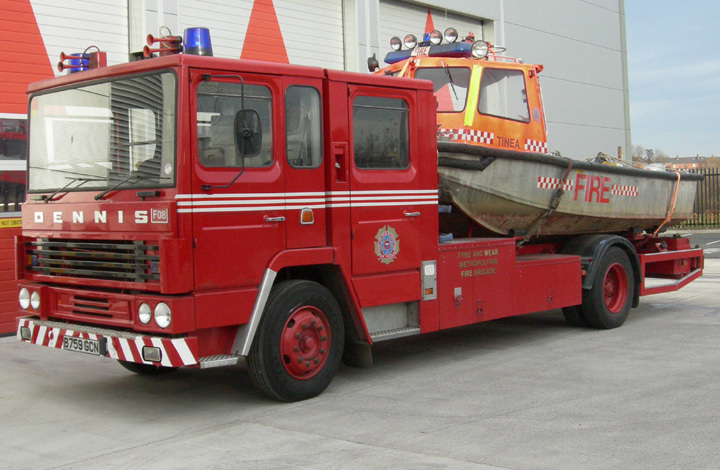 Access hatches enable river water to be fed into onboard portable pumps for either delivery through hoses to the shore or for firefighting using the roof mounted monitor. This machine went into preservation on the 1st of December 2006. Added by Bomba Boy on 02 December 2006. The decision to deploy using a TL was two fold. First, the home station for the boat had a TL and secondly the river Tyne is tidal. When the river is low, quite a long reach is required to position the boat into the water. Although I am sure a HI-AB of suitable size is available the TL performs the task without any effort. The replacement boat is launched in an identical manner today. Best wishes from Northumberland, England. Added by Dr. B.A. Hutchinson on 04 December 2006. Seems an odd use of resources! What happens if the TL is already on a shout and the boat has to be launched? Added by Colin Arnold on 03 February 2007. Colin, the Brigade has 3 TL's (actually now 2 Bronto's and a TL). There had never ever been any conflict. Added by Barry on 03 February 2007. This unusual m/c won an award at the 2007 Preston Hall Fire Engine Rally (23rd/24th June). Added by Malcolm Paul on 27 June 2007. Added by Jamie Calver on 15 December 2007. Hi there!Water high? Water Low? No problem with a winch on the crane! Added by Anders Fallström on 26 August 2015.